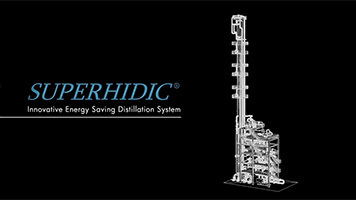 SUPERHIDIC developed by TOYO provides an excellent energy saving above 50% compared to conventional distillation system in various industrial applications. SUPERHIDIC offers attractive economics without utilizing special equipment but applying well proven technology related to distillation and heat transfer. Moreover good maintainability can be achieved with SUPERHIDIC. Technology and Toyo Engineering Corporation. Side-exchangers can be provided at composition where enthalpy change should be provided. Heat transfer area can be adjusted so as to meet desirable heat duty. Pairing of stages between rectifying section and stripping section can be determined in consideration of desirable heat duty and temperature difference. Overall heat transfer coefficient can be predicted in high confidence level. Side-exchanges can be accomplished by means of thermo-siphon/gravity. Normal trays or packing is utilized. Side-cut to obtain intermediate product or multiple-feed can be carried out. Feed stage can be optimized. Highest energy saving performance in distillation system developed so far. Good maintainability as normal facility. The browser that supported video tag is necessary. Excellent energy saving with good economics is expected by introducing SUPERHIDIC for the following conditions at existing column modification or new installation. 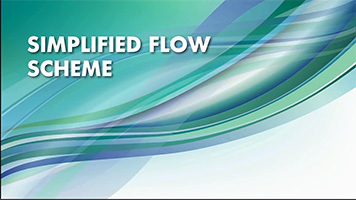 *SUPERHIDIC® can make reboiler utility at lower pressure level.